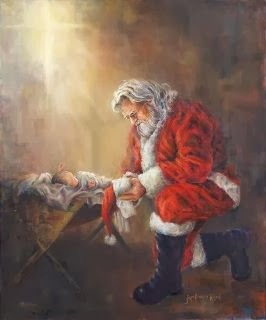 We start by the narrator saying the best place to start is the beginning: when Santa was a baby. First, when Burgermeister Meisterburger heard of him, he ordered to get rid of the "brat". In the process of removing him, there was immediate trouble but the babe was whisked away and cared for by a loving family. As he grew in wisdom and stature, he was taught to strive for quality… worthy of a King. Years go by and he is filled to overflowing to share love. Now a man, he is strong and ready to face any obstacles. He finds opposition is great and many burdened by daily duties, especially the children he cherishes – working hard to gain acceptance. “That’s the only way they judge you around here, by how many chores you do and how clean your stockings are”, they grumble. And so it was. There was an escape. Time went on and people grew to accept the gift of profound love dedicated on one night. Hmmmm…seems to me this story is vaguely familiar…no?